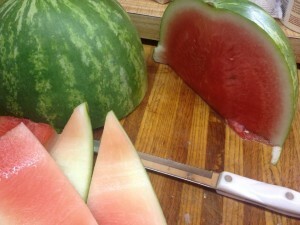 So the summer time is aproaching… that means it is time for MELONS!!! Watermelons, Honeydew Melons, Muskmelons, Canary Melons, San Juan Melons, even Cantelopes (poor thing didnt get to fit in namewise for some reason with his ‘melon’ siblings) …. But sometimes the problem with melons are the fact that you get SO many, and sometimes they are very large. If you are anything like me, you can only eat so much watermelon… in fact, I dont actually care for watermelon very much at all, butI do love so many others. SO, I saught out a new way to use these wonderful summer melons and a good jam recipe came to mind…. or is it Jelly? !